When I was young, I played both football and basketball games at Bremerton High, now the center of a national prayer controversy regarding the public schools. In the early 1970s while playing games in Bremerton and many other high schools in the state, our coaches led us in prayer. Here are my thoughts on the prayer controversy, faith and the First Amendment, and the predictable teamwork between Satan and the secular schools. When the news first broke about Coach Joe Kennedy and Bremerton High, it brought back some memories for me. I was born in Bremerton in 1953 because it had the only hospital in the county at the time. Today it is a picturesque port of about 40,000 people just a ferry ride away Seattle. From where I grew up in Port Orchard, you can see the snowed capped Olympic Mountains behind the city with sparkling blue waters in the foreground. Bremerton began to grow in 1891 when William Bremer, a German immigrant and businessman, encouraged the U.S. Navy to buy 190 acres of his water-front property for a naval port. Over a century later, Bremerton’s Puget Sound Naval Shipyard continues to serve some of the biggest ships in the world and employ 8,000 civilians. It does so because large aircraft carriers fit nicely in the deep waters of Sinclair Inlet. The first department stores I shopped–J.C. Penney’s and also Bremers (named after the city’s founder)–were located in Bremerton. During high school, all of us teenagers piled in 1950s and 1960s Fords and Chevys to “cruise” downtown. It was the going thing at the time. For three years I played football and basketball games at the Bremerton High field and the school gymnasium. They beat us in football but we returned the favor in basketball. Before many of the games, our coaches would lead us in prayer–not to win or be successful–but for God to protect us from injury and help us to play with good sportsmanship. There were all kinds of guys on my team–some followers of Christ, others general believers in God, and some that didn’t believe at all. But everyone closed their eyes and seemed to appreciate the quiet moments of prayer for safety and good character. 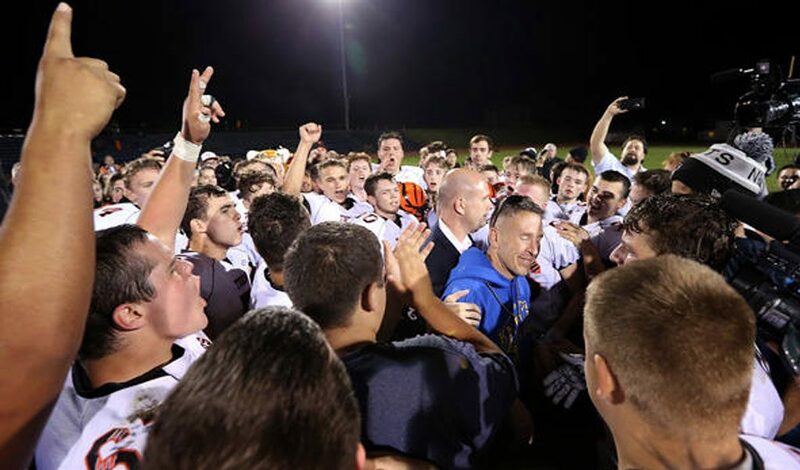 Last month, a few students and parents complained to Bremerton High School officials about Assistant Coach Joe Kennedy leading a short prayer after the team’s games on the same field where I played and prayed forty years ago. Coach Kennedy had been doing this for eight years–as well as many coaches before him. The prayer time was voluntary. It was not a required team activity. After the game ended, Coach Kennedy simply went to the center of the field. Some players joined him as he thanked God for the night, for the wonderful kids he was coaching, and the privilege of being Americans. This same exercise happens after every NFL game when many players from both teams meet in the center of the field for a brief time of prayer. It’s also voluntary. Many players choose not to attend. But a couple of weeks ago, the powers that be at Bremerton High said to “cease and desist.” Coach Kennedy stopped the after-game prayer for one week, then after getting some advice from Liberty Institute, a Christian legal firm, he resumed his ten year custom of voluntary prayer at the 50 yard line. Soon after that, the school district sent the coach a letter informing him he has been placed on paid administrative leave and would have to attend the last game of the year as a spectator, not as a coach. Kennedy was “devastated” over the suspension. “I love my players and I hope I can continue coaching them and being a part of their lives,” he said, according to Liberty Institute. Kennedy was informed in the letter of standards that he is expected to accept, like not participating when students are engaged in religious activity as to not show “endorsement of the activity.” He is free to provide “motivational, inspirational talks” to the students, but this does not include “religious expression” such as prayer. In America, that’s a bunch of horse crap. On Oct. 14, Liberty Institute sent the school district a demand letter to inform the district that coach Kennedy is not in violation of any law. It stated that Kennedy would continue to pray post-game. But Bremerton High said no. There would be no more prayers by the coach on the football field. And the public school officials had an interesting ally. Two students had approached The Satanic Temple after they made a public offer to get involved. So the Satanists joined the school and even showed up at the final game to make sure that no prayers to God were publicly uttered. Satan and public schools–teammates! Does that seem odd or are they really on the same side? It’s obviously the latter. Satan wants nothing more than to destroy the memory of Jesus Christ and Father God from Planet Earth. The goal of secularism–now entrenched in our government and thus public schools–is committed to do the same thing. They’re natural teammates. But here’s the simple truth, first historical and then pertaining to the future. Notice the wording. First. Congress shall make no law. In other words, the Federal Government can’t pass a law to make Americans worship a particular religion. The amendment bans Congress from religious tyranny, not schools, teachers, coaches or individuals of any type. That’s pretty straight forward. Secondly, Congress can’t prohibit any free exercise of religious beliefs. Period. The Federal Government has no role in that. And there’s a third American pillar of religious freedom: Majority rule. Thus, for two hundred years the American government both allowed and encouraged faith in God in all aspects of public life. Even Thomas Jefferson attended church in the US Capitol Building. Because the majority of America believed in God and the First Amendment guaranteed religious liberty. Christianity is favored in the public square because it’s the majority faith. For over two hundred years those three principles held sway over American life. But beginning in the 20th century, the First Amendment became distorted by erroneous Supreme Court decisions, the federal government grew in size and power, and the secular worldview pushed by disgruntled atheistics began a war against Christrianity in American life–especially through the courts. Atheists are different today. Instead of appreciating the blessings that Christian faith and culture have given to America, they’ve decided to militantly try to eradicate it. It’s sad and ironic that in the 20th century the atheistic USSR banned prayer and the Christian faith from public view while America encouraged it; In the 21st century Russia now encourages Christian faith in its environs while US atheists and a sympathetic federal government are trying to destroy it. They’re also very shrewd. They say we must ban all religion to be fair and neutral. But banning faith in God is establishing atheism as the official religion of the federal government against the wishes of the Christian majority. That’s pretty clever if it weren’t so demonic. Just like Coach Joe we must righteously stand up for religious freedom being reborn in our back-slidden nation. We can do this, knowing that one day Jesus Christ will be the ultimate victor over all the political correctness and the schemes of men and fallen angels. His truth will be victorious.